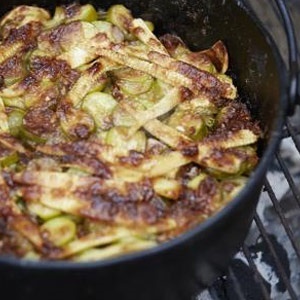 Grease a big potjie (number 3 or bigger) with butter. Layer the vegetables in the pot, adding some soup powder and a few pats of butter in between. Put a few pats of butter on top and put the lid on. Put the pot on hot coals and put a few coals on the lid. Cook for an hour. Keep the coals hot, but make sure the pot doesn’t burn. Don’t stir. When the vegetables start to caramelise and are tender, the dish is done.